The One Center City (OCC) Advisory Group, tasked with developing a plan to increase mobility in central Seattle during the impending period of maximum constraint, released its recommendations for near term capital projects in June. The plan must still be approved by the Seattle City Council and other stakeholders. Early discussions proposed transformational changes downtown and large-scale bus service restructuring, neither of which materialized in the final list of projects and improvements. The OCC group was formed in order to proactively keep megaproject-related pain to a minimum over the course of 2019-21. During that time, Highway 99 will move from the viaduct to the new deep-bore tunnel, the Washington State Convention Center expansion will close critical parts of the grid, a critical bridge in South Lake Union will be closed and rebuilt, and the transit tunnel will close to buses forever. The most significant changes that the OCC group endorsed are northbound transit-only lanes on 5th and 6th Avenues. Some Metro routes will move to those streets from 4th, while Community Transit and Sound Transit buses would remain in their original configuration. The hope is that the 4th Avenue buses will benefit from a lower volume of bus traffic. SDOT would also invest in queue jumping and signal priority for buses on both 2nd and 4th. However, since overall traffic on all downtown streets is expected to increase during the period of maximum constraint, the gains for 4th Avenue buses might be marginal. In addition to its mitigation work, OCC also had an ambitious mandate to transform central Seattle. SDOT documents from the beginning of the process called for a “20 year vision” and corresponding action plan. The group has not presented a plan along those lines, but the latest OCC documents indicate that the vision plan process has only just begun. A slide in the latest OCC deck includes a new name and slogan for the advisory group formerly known as One Center City: “Imagine Downtown: Big Ideas for the Heart of Seattle.” The deck also suggests that a similar plan from Auckland, New Zealand will serve as the model for the Imagine Downtown report. Some of the more ambitious projects mentioned in early OCC discussions included constructing a protected bike lane on 4th Avenue, and transforming 5th Avenue into a transit mall along the lines of 3rd Avenue. The 5th Avenue project won’t go forward, as advisory group members were concerned that 5th Avenue might become a magnet for sidewalk crowding and petty crime, along the lines of 3rd. The 4th Avenue bike project was postponed until 2021. Another significant idea that planners dropped was a major restructure of Eastside, Snohomish, and Pierce-to-downtown buses. A restructure would have diverted some buses to the Husky Stadium Link station, and terminated some intercity routes at ID/Chinatown station and the north end of downtown, according to a January 2017 OCC document. However, in advance of potential future service revisions, the Husky Stadium station’s transfer environment would be reworked. The plan would implement all-door boarding, wayfinding improvements, and bus stops closer to the Link station’s entrance. The ID/Chinatown station hub would see improved bus stops in the area, with longer bus zones, improved lighting, and signage. The most significant transit improvement of the OCC action plan is an investment in the 3rd Avenue transit mall. OCC recommended that ORCA readers be installed at all ten 3rd Avenue stops that do not currently have them. OCC also recommended that 3rd Avenue’s partial ban on private cars should be extended to 6 AM to 7 PM, eliminating the midday gap. There were some discussions of making the ban all day, seven days per week, but they did not progress very far. Some OCC members were concerned about the impacts on deliveries for merchants, and access to parking garage entrances on the street that predate the transit mall. 3rd Avenue will see a higher volume of bus traffic than ever before, since the transit tunnel will be closed to bus traffic starting in March 2019. In all, while there will be some substantial improvements to downtown transit mobility, the OCC group mostly opted to maintain the status quo. Transformational projects like the 4th Avenue bike lane, the 5th Avenue transit mall, and a permanent car ban on 3rd Avenue, fell victim to political pressures and leadership chaos. The Center City Connector streetcar on 1st Avenue is also under pressure, as Mayor Jenny Durkan halted construction over cost concerns. The ultimate fate of the streetcar is not yet decided. Sound Transit and Metro were hesitant to introduce restructures that would compel Eastside riders to transfer at UW and give up single seat trips to downtown. Rider response to that idea was overwhelmingly negative. Merchants and downtown leaders were skeptical of the major projects, while bike and transit activists were more enthusiastic. The process was also handicapped by the chaos at City Hall: the OCC process was roughly concurrent with the scandal that brought down Mayor Ed Murray, and Seattle saw four mayors over the course of the group’s deliberations. SDOT was also hamstrung by former director Scott Kubly’s own scandal, and the fact that the agency still does not have a permanent head. There was never a consistent set of priorities that the city’s political leadership advocated for. So, in the end, downtown Seattle will see limited changes before crunch time starts this fall. Thanks for the story. I appreciate the details about both the process and the result. With the new ORCA readers downtown, what does that mean in terms of fair collection? Does that mean I can tap my ORCA card on the street, and get on any bus? If so, does that mean all the buses that run on Third will have fare enforcers or it an honor system for those that board there? At the streetcar terminal, tap only for the streetcar. For the C, tap on the bus. I wonder how many people read the sticker next to the reader. Maybe more people than read the old “Tap only before 7pm” stickers. PS. I encountered two malfunctioning readers over the weekend. One was at UW Station; it appeared to be off, but when I went to the other reader and came back it acted like it was booting. The second was on the B, it said “Unit Faulty”. Has anybody yet been warned or cited about streetcar vs. bus “tap?” Dumb beyond intergalactic stupidity. Especially with a completely unfamiliar rule signed in an unreadable place! We ought to buy a one-time EMP hit from Vladimir Putin to kill all those atrocities. But while he’s getting the giant obsolete Bear bomber with two propellers on every engines fired up to at least blow out Twitter on the West Coast , at least get one last use out our President’s business partner before he goes back to screwing with upcoming election. The streetcar doesn’t run on Third. 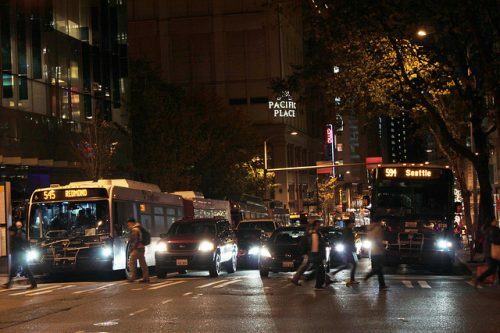 There are a bunch of buses that run on Third — some RapidRide, some not. Thus my question. Do I tap only for RapidRide, or do I tap for any bus? I assume that the RapidRide bus stops already have readers, which would mean the addition is for the stops that don’t (i. e. the stops serving non-RapidRide buses). That would make sense, and greatly speed up boarding. But I’m not sure how they will handle fare enforcement, which is why I asked. Since Seattle has never done this before and the plans aren’t public yet, nobody knows. At the existing shared stops the ORCA readers are for RapidRide only. I don’t know if that’s a technical limitation (they can only tap onto one route) or lazyness (they won’t set it to generally validate the location regardless of route). My understanding is that off-board tapping is for all routes (why else would it be added at non-RapidRide stops? ), with Metro hiring a few more fare enforcement staff do deal with the edges of the proof-of-payment zone. Yeah, that’s what I figured, but I thought I would ask. I think that is very interesting, and a very important change. It means that the focus of off-board payment is moving from a handful of RapidRide routes, towards the entire system. It has more to do with where your bus stop is versus what you are riding. It seems like they will take the same approach at Husky Stadium, which is great. In the future, I could see it being used for other Link stations that serve mainly as transfer points. Northgate Transit Center, for example, would make sense for off board payment. Instead of all those riders tapping their ORCA cards to get on the 41 (and other buses), they would just walk on via either door. At worse you have someone sneak on by walking to the transit center, but I really don’t see why that many people would do that. Well, ORCA riders will have a transfer on their card. Non-ORCA riders won’t use the readers. In a fully off-board payment scenario, there are parking meter kiosks for cash payers that give receipts, and you show the receipt to the inspector. Or the agency just flat-out forbids non-card riders. So, should the 70 be sent over to Eastlake? It can’t because it’s a trolley route, and during peak hours, there are not enough spare diesel buses to replace it. So if it can’t be moved, and it can’t keep running down the bridge, what’s the plan? The 71/72/73X ran on Eastlake. Where did all those artics go to? @Mike Orr, I’m sure they’re on other routes that’ve needed them. @asdf2 and @myself, on second thought, I think the trolleybuses are just going to go off-wire for a few blocks down Eastgate and Aloha. The detour diagram shows the recommended transit detour as being Aloha St. over to Eastlake. It looks like some work is planned on Aloha before the bridge closes. Looks like metro has been involved in the planning, but I didn’t notice any specific reference to trolley wires, just replacing a roundabout with a raised intersection. @William C. that was the killer feature of the new trolleys, the ability to go off-wire when needed. I imagine that’s what Metro will do. How much is the service delay each time the poles go up or down? I’ve been on a 1 that put up the poles in the trolley pans in Belltown. It was maybe slightly longer than a normal stop. If the pans aren’t there then it has to be done by hand and adds a minute or so. It’s interesting they’re going to remove the roundabout. It looks far easier to get a bus around than the one TriMet has to deal with at SE Clinton and 23rd here in Portland, and that’s a permanent route. The dozens of artics were redeployed? Metro needed that much of an increase? So “downtown leaders” (whatever that means) get listened to but “cycling activists” are ignored. No poll of cyclists along the lines of “would you rather there be ORCA readers on Third Avenue while you continue to risk your lives in traffic?”, while Eastside “riders” do get asked if they’d prefer to lose their unearned privileges. It might help if you cease to adopt the jargon of the oppressors here. If cycling activists were job creators and paid millions of dollars in taxes and had connections, then the city would listen to them too. Since they don’t, they’re not much of a leader. We just gave them an additional billion dollars to work with too. They have the support from the public, business community and politicans. It’s the war on cars part, combined with limited funds and higher-than-expected costs. The Lander Street Bridge is a partnership with a large government entity and a joib center, so it’s not wasteful. Apparently we have to do a lot more than just vote for transit measures to show we really are the majority and won’t punish them at reelection time. You should see the Seattle Times comments. It’s also a frar that cars will slow down and lead to major backups, and that’s bad for a city.